Open Doors is pleased to announce the completion of 11 archive import projects in 2018, a total of nearly 12,000 works, bringing the total number of works preserved over the lifetime of Open Doors to just shy of 100,000! We hope that you will find old and new favorites in the collections listed below. MTAC was an NCIS fanfiction archive for all characters and pairings, including crossovers, founded in 2006. Find works at the MTAC AO3 collection. For more information about the archive and its move to the AO3, see the MTAC announcement post. To learn about the history of the archive or share some stories of your own, check out the MTAC Fanlore page. The New Adventures of Sinbad: Fan Fiction Season 2 was a fanfiction virtual second season for the TV series The Adventures of Sinbad. Find works at the New Adventures of Sinbad AO3 collection. For more information about the archive and its move to the AO3, see the New Adventures of Sinbad announcement post. To learn about the history of the archive or share some stories of your own, check out the New Adventures of Sinbad Fanlore page. The Boy / Michael Shanks Fanfiction Archive was a “multi-Michael” archive for gen, het or slash fanfiction about any character portrayed by the actor Michael Shanks. It was founded circa 2002. Find works at The Boy – Michael Shanks AO3 collection. For more information about the archive and its move to the AO3, see The Boy announcement post. To learn about the history of the archive or share some stories of your own, check out The Boy Fanlore page. The Spooky Awards, also known as the Spookys, were an annual fan-run event to recognize excellence in X-Files fan fiction. Alice_ttlg hosted the award winners from 2003-2005. Find works at the Spooky Awards collections. For more information about the archive and its move to the AO3, see the announcement post. To learn about the history of the archive or share some stories of your own, check out the Spooky_Awards fanlore page. The Unknowable Room was a Harry Potter archive for fanfiction and fanart, focused primarily on Marauder-era works and Lily/James as a primary pairing. It was founded in 2005. Find works at the Unknowable Room AO3 collection. For more information about the archive and its move to the AO3, see the Unknowable Room announcement post. To learn about the history of the archive or share some stories of your own, check out the Unknowable Room Fanlore page. Death-Marked Love was a Buffy the Vampire Slayer fanfiction archive focused on the Spike/Buffy pairing founded in 2001. Find works at the Death-Marked Love collection. For more information about the archive and its move to the AO3, see the Death-Marked Love announcement post. To learn about the history of the archive or share some stories of your own, check out the Death-Marked Love Fanlore page. The Firefly’s Glow was an archive founded circa 2002 for Firefly fanfiction of all types — gen, het and slash, all pairings, all ratings. Find works at the Firefly’s Glow collection. For more information about the archive and its move to the AO3, see the Firefly’s Glow announcement post. To learn about the history of the archive or share some stories of your own, check out the Firefly’s Glow fanlore page. The Artifact Storage Room 3 was a The Sentinel fanfiction archive founded in 2008. Find works at the Artifact Storage Room 3 collection. For more information about the archive and its move to the AO3, see the Artifact Storage Room 3 announcement post. To learn about the history of the archive or share some stories of your own, check out the Artifact Storage Room 3 Fanlore page. The Glass Onion was a multi-fandom fanfiction archive founded in 2001. Find works at the Glass Onion collection. For more information about the archive and its move to the AO3, see the Glass Onion announcement post. To learn about the history of the archive or share some stories of your own, check out the Glass Onion fanlore page. Pretty Lights was a multifandom actor RPF Secret Santa challenge which ran from 2005 to 2010. Find works at the Pretty Lights collection. For more information about the archive and its move to the AO3, see the Pretty Lights announcement post. To learn about the history of the archive or share some stories of your own, check out the Pretty Lights Fanlore page. P/K All the Way was a Star Trek: Voyager fansite founded in 2000 that included a small fanfiction archive for stories dedicated to the Tom Paris/Harry Kim pairing. Find works at the P/K All the Way collection. For more information about the archive and its move to the AO3, see the P/K All the Way announcement post. To learn about the history of the archive or share some stories of your own, check out the P/K All the Way Fanlore page. A huge THANK YOU to all of the archivists and volunteers who made these imports possible, as well as all the creators who have transferred or claimed their works! 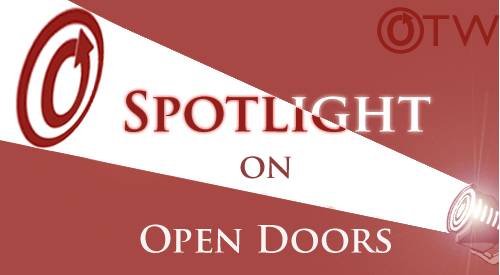 For a full list of Open Doors projects, please see the Open Doors Fanlore page.